If this was a series of articles, this would be the third one. If you previously read my articles on simple and configurable product creation in Magento, you already know the basics. 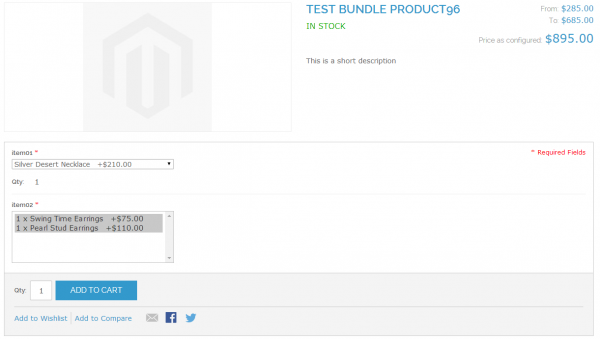 In this article we’ll expand our knowledge and learn how to create a bundle of products programmatically in Magento. A bundle of products would be something you’d want to sell in batch. It might be easier to understand what a bundle product is in Magneto from the picture. 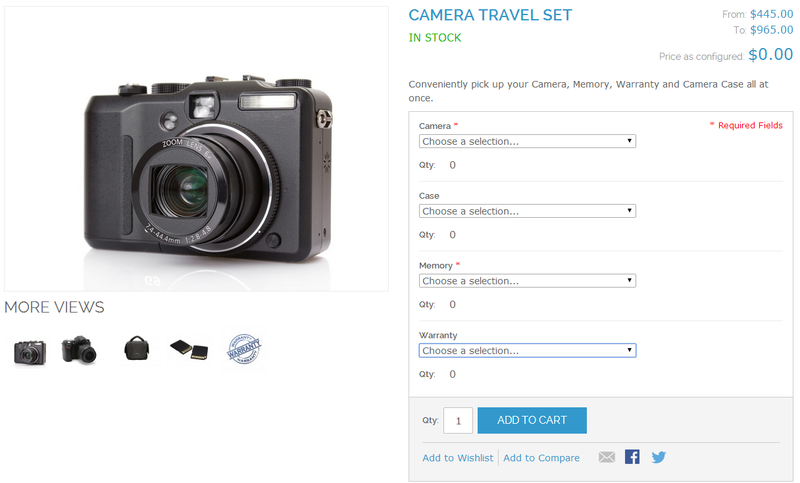 We can take an example from Magento’s sample products. We can see that this products has options. Each custom option’s value corresponds to one simple product that’s associated with the bundle. For example, we have Camera option and Madison LX2200 and Madison RX3400 as it’s values. Each one of those cameras is a simple product (called ‘selection‘ in admin). Now that we have gone through the basics, we’ll create the code necessary to create a bundle product with two options – each one containing two values to represent simple products. You can find comments next to each line of code below. I tried to comment as much of the code as possible, so you have some helpful hints as to what each of the lines represents. It’s important to master the concept of a bundle product before running the code above, otherwise, you’ll probably end up setting values the wrong way. I assume you already know how to figure out which data you can set for a bundle product. (Hint: read the articles in the links above). As always, I’m here for any questions you might have. Thanks, You have explained very nicely, and here’s an easy to follow tutorial for creating bundle products in magento 2 at: https://magenticians.com/bundle-products-magento-2/ Sharing here as I found it very useful. I hope others will like it too. where should i put this codes??? Through data installs, in an observer or just create a php file in the root of your install. There are many ways to execute this code. can u help me to resolve this ?